Home buyers are tapping into new discount loans to service larger mortgages and it's adding plenty of fuel to Melbourne's real estate market. Despite the Reserve Bank's resolve to hold official rates at 2.5 per cent, mortgage rates are falling as banks and other lenders compete for market share. Property commentators say the lender competition in a low-interest rate environment is proving to be a decisive factor for buyers, particularly for upgraders. An upbeat mood was evident at many auctions and open homes on Saturday, with agents reporting competitive bidding and large crowds. The market appears to have resumed from where it left off last year. ''It may even be a little stronger,'' said buyers' advocate Kim Easterbrook, from Elite. 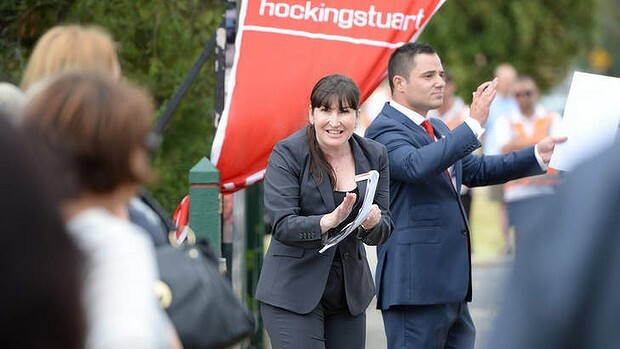 She attended auctions in Prahran, Collingwood and Northcote on Saturday, and said each sale drew a big crowd and achieved prices 10 per cent to 20 per cent above reserve. Sales conditions have a measured tempo in many suburbs. Buyers don't seem to be panicking, most are sticking to their spending limits, and for every runaway sales result there are other properties that just get over the line or sell for a price that's slightly below reserve. Fairfax-owned Australian Property Monitors reported a clearance rate of 74 per cent from 436 auctions. The Real Estate Institute of Victoria, which unlike APM includes Geelong sales in its results, said 432 properties sold from 600 auctions to give a clearance rate of 72 per cent. On Saturday, many vendors were owner-occupiers who had bought new homes last year. They were keen to sell, with some prepared to discount. Jellis Craig director Richard Earle said there hadn't yet been enough auctions to draw hard conclusions. Low interest rates give an affordability advantage to buyers. APM senior economist Andrew Wilson said the average weekly mortgage repayment for Melbourne home owners was $50 less compared to two years ago. ''That's what is really driving the market - mortgages are more affordable in terms of repayments,'' he said. Buyers' advocate Catherine Cashmore stressed there was a difference between mortgage serviceability and affordability. Commentators are cautioning buyers to focus on infrastructure and scarcity. Monique Sasson, of Wakelin Property Advisory, said there were now three distinct markets in Melbourne: the new unit market, established properties in the middle and inner suburbs, and housing estates on the city's outskirts. Ms Sasson expects new unit prices to be hit by oversupply. She said the need for heavy private car travel in the outer estate areas had an impact on price growth. ''It has a direct drag on values and on demand,'' she added. More than 1000 auctions are scheduled by the REIV for next weekend.